Leafy greens – food of choice for gym junkies? 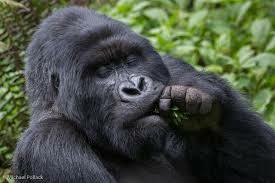 Last week we talked about the genetic similarity of primates and humans, and how gorillas maintain such a high muscle mass, despite eating very little animal protein, but a large number of leafy greens. How can this be so? A little known fact about leafy greens is that they are surprisingly high in protein. Most of us have placed leafys in the general category of “vegetables” and thus mistakenly conclude that they are not a good protein source. When in fact leafy greens contain good quantities of amino acids, the building blocks of protein. There are 9 amino acids that are essential for humans—which means we must get them through our diet, as we cannot synthesize them in our bodies. When looking up the nutritional analysis for kale, I was amazed to find that approximately 400 grams of it supplies almost your entire recommended daily requirement of essential amino acids! Some leafy greens contain higher amounts of amino acids than others, so it’s important that you vary the types of greens you eat. No matter how much you may love kale smoothies, it’s a wise choice to try some spinach, chard and silverbeet as well! Week two produced new findings – changes in our bodies and flavour combinations/ingredients for our smoothies. 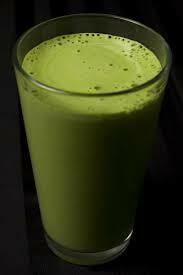 I’m really starting to crave my daily green smoothie now – feels like health in a glass! It was my birthday in the weekend and I was away skiing – suffice to say there was an increased intake of alcohol, chocolate and other treats. I’m reasonably sensitive when I overindulge – the next day I’ll feel a bit tired or not quite myself. But since starting the smoothies I’ve noticed that such foods don’t seem to have such a detrimental effect on my mood and energy levels. Favourite surprise ingredient: Parsley. It grows like a weed in my garden so I’m throwing it in at every opportunity. Nutritionally it’s a great addition, bringing with it high levels of iron and vitamins K, C and folate. Its also highly alkaline meaning it can combat the acidity of processed foods. Plus I absolutely adore the gorgeous shade of green smoothie it produces. I have found the initial hype of this experiment is beginning to subside and it has been difficult to find motivation to wake up that little bit earlier in the morning to make my smoothie. But once I make that glass of green goodness it really does slide down like silk to fuel my flame (or body in this instance). I haven’t skipped a day yet and I don’t intend to, I am determined to see this challenge through and am not one to give up. Changing flavour combinations up keeps things exciting. My latest discovery.. add almond milk and dates to your green smoothie to create a delicious caramel flavour (perhaps not as healthy as some other recipes but if you are going fall off the wagon or are craving something sweet, these ingredients are a good alternative). My body is really encompassing the extra nutrients the smoothies are providing and I think If I stopped taking them I would really notice the difference. My energy levels have been far better even though I have been sleep deprived this week. Ginger definitely sounds like a dietary keeper!! This weeks recipe highlights that you can make your smoothie tasty whilst maintaining a great nutritional value. Stay posted for Week 3 – We are only half way through and have already noticed fairly significant changes! Get on board and finish our challenge with us.